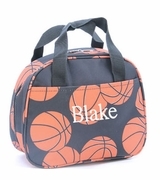 Personalized paisley lunch totes for girls. Brighten up any day with this fun and colorful paisley pattern lunch bag. 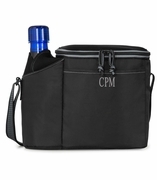 The bag offers a spacious main compartment to hold your snacks, sandwiches and a drinking bottle. A lower portion turquoise zipper closure adds a stylish finish and ensures that the contents are safe and secure. Carry the lunch bag using the grab-and-go handle on the top. Pair with a matching backpack search item SJ-1120-07 in the same design.